What happens when relationships start to go sour and arguments creep in? How can you manage conflict so that neither of you gets badly hurt, and the relationship does not suffer? Better still, are there good ways in which you can turn the situation around and rescue your relationship? Is ‘getting it out into the open’ a good thing? 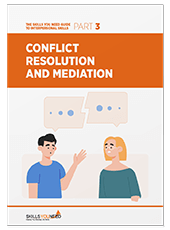 This page explores some of the issues connected with conflict within relationships, and discusses some of the skills required to avoid, manage and move on from it, to make your relationship stronger, and hopefully help it to last longer. This page does not cover conflict where one partner is physically or emotionally abusive, including domestic violence. If you are concerned that you, or someone you know, may be in a situation involving domestic violence, then you should seek help and advice. One source of advice in the UK is the 24-hour National Domestic Violence Freephone Helpline, run in partnership between Women’s Aid and Refuge. There are more resources available here. A conflict in a relationship may be defined as any kind of disagreement, including an argument, or an ongoing series of disagreements,for example, about how to spend money. Conflict can be extremely stressful, but it can also act to ‘clear the air’, surfacing issues that need discussion. Conflicts and disagreements may result in us becoming angry, and they may also arise because we have become angry about something else. At work, we might try to control our anger and avoid saying things we might regret. At home, unfortunately, we are much more likely to say hurtful things to others as a result. There are also less likely to be others around who can mediate, and disagreements therefore quickly escalate in a way that might not happen at work. This means that conflict in a relationship can rapidly become very unpleasant, and also very personal. Sadly, when we are close to people, we often know how best to hurt them. In anger, that may be exactly what we want to do, however much we regret it later. Compete or Fight, the classic win/lose situation, where the strength and power of one person wins the conflict. Denial or Avoidance, where you pretend there is no problem. Smoothing over the Problem, where you maintain harmony on the surface, but do not resolve the conflict. Compromise or Negotiation, where both give something up to create a middle ground. Collaboration, working together to create a shared outcome. These strategies are also applicable to conflict in personal and romantic relationships. However, many people never get further than denial, smoothing over or fighting. The problem with this, however, is that these are not long-term strategies to resolve the issue. They are, at best, papering over the cracks, and this is not possible in a long-term relationship (or rather, the relationship is unlikely to prove long-term if this is your chosen approach). As a general rule, honest communication about feelings, especially feelings about something being wrong, is always going to work better in a romantic relationship. The key in a relationship, therefore, is to move beyond those three to compromise or, best of all, collaboration. This is likely to result in a better result than win/lose, but it’s not quite a win/win. Because both of you have given something up, neither of you is likely to be completely happy with the outcome, which may lead to revisiting the discussion over and over again. When you collaborate, by contrast, you work together to create a win/win situation, building on the conflict. It does take time but, in a relationship, it is worth the investment. Managing conflict requires a commitment from both of you. Talk beforehand about how you would like to manage disagreements, and also agree that you will help each other to do that. You may find it helpful to talk about how you behave when you are angry, and support each other to manage that. For example, if one of you becomes angry very quickly, it may be helpful for the other to propose waiting until later to talk. You may find our pages on Anger and Anger Management helpful. Then walk away, and go off somewhere to calm down. We are all more likely to be grumpy and difficult when we are tired or hungry. It is human nature. Avoid having difficult conversations at difficult times. Instead, find a time when you are both relaxed and comfortable, and the conversations are less likely to escalate into an argument. Some people prefer to go out for a walk, and others find time at home is better: try things out and see what works best for you. There is more about this in our pages on Giving Feedback to Partners and Having Difficult Conversations with your Partner. You may feel that you were in the right. You may even have been in the right. Being prepared to apologise for the way that your partner feels, however, will go a long way towards ensuring that they feel they have been heard, and that you understand their concerns. This is especially true if, despite your best intentions, you ended up shouting at each other. Apologising doesn’t mean you have to accept that you were wrong. It means saying that you are sorry that there was a disagreement, and you are sorry that your partner is upset, and that you are committed to finding a way forward that works for you both. Be prepared to listen to your partner. Don’t just repeatedly explain your own point of view or you will end up fighting again. Building a compromise or a collaborative solution requires real understanding of what is important to them, and why, and a discussion that shares viewpoints and opinions constructively. You may find our pages on Listening Skills helpful. …a long-term relationship is a partnership. You may or may not have made a formal commitment to each other but, if you want the relationship to last, you need to work together to develop the skills to manage differences of opinion. Learning how to disagree constructively, and build a compromise or collaboration, is an important part of this.